I have a tremendous passion for worship and liturgy and love being able to craft meaningful liturgies for my people. More than that, I love seeing God's people at worship, gathered around font and table, word and song. During my first Proclaim gathering in 2016, I remember hearing the stories of the early "instigators" (as we call them) of what is now ELM. Their bold witness and the witness of so many queer colleagues in ministry, both living and sainted, gives me the inspiration and strength to keep going. In particular, two pastors - Rev. Trey Hall (former pastor at Urban Village Church, Chicago) and Rev. Craig Mueller (pastor at Holy Trinity Lutheran Church, Chicago, my home congregation) - have been hugely influential in my own journey in these past few years. Wait, there's life outside of ministry?! Well, in my precious free time, I enjoy reading, drinking coffee, enjoying all things Milwaukee, watching inordinate amounts of Netflix, and spoiling my two cats (Oliver and Sophia) and their canine sibling (Roscoe). Oh dear. I love to eat, so this is really hard. I think one of the things I'll miss most about Omaha is Rivera's Mexican Restaurant, a favorite after-text study lunch spot. The enchiladas potosinas are simply amazing. Fair warning, should you find yourself at Rivera's: When they say spicy, they do mean it. I grew up in Shelby Township, Michigan (north suburb of Detroit) and graduated from Concordia University in River Forest, IL, in 2011 with a B.A. in English. In between undergrad and seminary, I spent three years working in retail, a historic house museum, and a golf course call center. Throughout college, seminary, and the years in between, Chicago was home for 11 years, minus one year spent in Omaha, Nebraska, where I served my internship year among the people of God at Augustana Lutheran Church. 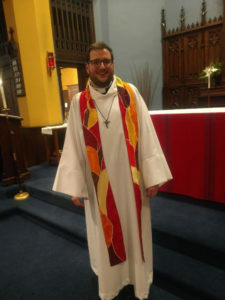 After graduating from the Lutheran School of Theology at Chicago (LSTC) in May 2018, I worked for a brief time with the Global Mission Unit of the ELCA before accepting a call to serve as associate pastor at Unity Lutheran Church in Brookfield, WI. For as far back as I can remember, my two career dreams growing up were teacher or pastor. (Yes, I was *that* super cool kid who played school at home because clearly I didn't get enough of it during the week.) Ultimately, I decided on teaching (secondary education, English) in college...which lasted a whole semester until my first field education experience in a seventh-grade English classroom. Plan B (or so I thought) was pre-seminary. A tiny but crucial detail here: I grew up in the Lutheran Church - Missouri Synod. When I began to come out as gay late into my senior year of college, I knew I could no longer in good conscience pursue ministry in a church that didn't acknowledge and affirm the fullness of my identity. With my career on hold, I found myself spending two years in a new, progressive, United Methodist church plant (Urban Village Church) in Chicago, and it was there that I rediscovered what Christianity and church could be. That was also the place that reawakened my call to ministry and led me to check out LSTC and ultimately return "home" to the Lutheran church in the ELCA.